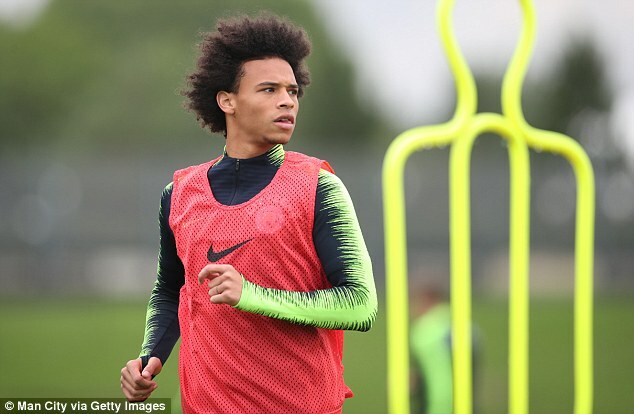 Manchester City stepped up preparations for Saturday’s lunchtime trip to newly-promoted Wolves as they look to retain their 100 per cent start to the season. Pep Guardiola’s men were in devastating form in their last match – a 6-1 home win over Huddersfield – and it was no surprise that the mood in the camp was high in training on Thursday. With so much competition for places in the squad, particularly in attacking areas, City’s stars looked sharp as they were watched studiously by Guardiola. Ilkay Gundogan prepares to step up following Kevin De Bruyne’s three-month lay off. Bernardo Silva has already helped fill the void left by the Belgian and he has reflected on his seismic improvement in his second season in Manchester. ‘I feel a lot better and adjusted to the team,’ Bernardo told the club’s official website. ‘I think in your second season, it’s normal to feel more at home and that definitely applies to me.